This looks like the ideal thread in which to have a quiz on world events during the last three decades of the 20th Century. These events dont have to be earth shattering or century defining. They can be like the pic below. What is the significance of this foto. Easy one for the Brits to kick off this new thread. Last edited by Donald the Great; 08-01-2019 at 00:14. My educated guess would be it's the London Bridge which was sold to the yanks ?? Is it true that they thought they were buying tower bridge? more to the point how would one dismantle something this big and reconstruct it ? In that case it was not beyond the yanks to build a bridge of there own , as Zincubus pointed out its not that spectacular is it? What is the historical significance of this photograph? Are they the "Busby Babes"? The Man Utd team that died in an aircrash, last photo of them all alive? this proves you are not rubbish at history @Zincubus. Quite A FEAT. 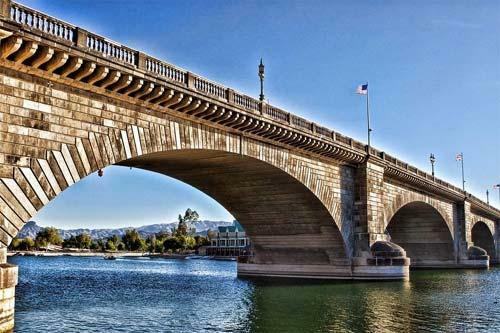 London Bridge is a bridge in Lake Havasu City, Arizona. It was built in the 1830s and formerly spanned the River Thames in London, England. It was dismantled in 1967 and relocated to Arizona. Last edited by Donald the Great; 09-01-2019 at 00:32. Last edited by Donald the Great; 09-01-2019 at 00:33.